a sing at the old courthouse in Decorah. A computerized Christmas Search YouTube for musical Christmas lights and youll find a variety of videos presenting holiday light shows that have been described as everything from fantastic to awesome to crazy. The Christmas lights at Del and Deb Cooks house flash on and off to the tune of various holiday songs. 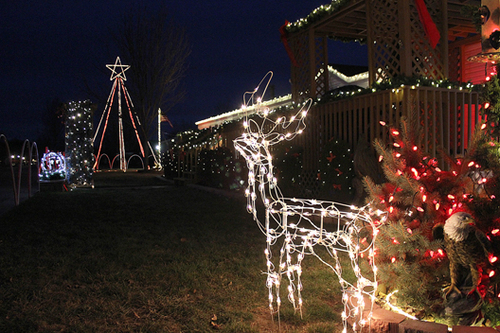 Their display includes archways, reindeer, a homemade Christmas tree and several stars. Click on just one of them and you probably won’t believe your eyes at least that’s the reaction Del Cook had when he sat down to watch a clip. “I was like, That’s not even real,” the Red Wing resident said.Originally in disbelief, Cook later came to realize exactly how the impressive light show was created and decided he wanted in on the action. This year, for the first time, his home offers a presentation for both the eyes and ears. Songs as diverse as Santa Baby, Crazy Frog Christmas and the Trans-Siberian Orchestras instrumental medley Christmas Eve/Sarajevo are a few of those that can be heard outside as strands of lights flash on and off to beats in the music. Organizing the show takes time and effort, but is made slightly easier with the help of special software, Light-O-Rama. Using the program, Cook was able to choose which lights he wanted to turn on at which times during certain songs that he selected. Not only could he turn them on, but he could direct them to flash, twinkle and fade, among other effects. While its a large project to take on, Cook had less trouble with it than most people might because of his experience with computers. Hes been fixing them for years and one of his regular customers recently got the opportunity to see Cooks skills up close. Red Wing resident Ray Howe had never been to Cooks house in Pepin Woods, but he didn’t exactly need detailed directions to get there. “He said, ‘Well, you wont have any trouble finding me. Just watch for the Christmas lights,’ ” Howe said. Cook wasn’t kidding. Enter Pepin Woods from Perlich Avenue, go to a T in the road and turn right. From there, flashing red and white bulbs in the distance make any further instructions unnecessary. This year, enough lights brighten the outside of the Cook home that if the strands were plugged in end to end and stretched out, they would cover the length of a football field seven times over. Still, that amount of lights hasn’t been as expensive as it sounds because the Cooks opted to decorate with energy efficient LEDs. “As a matter of fact, I didn’t even notice it on my electric bill,” Cook said. As they continue their light show in coming years, the Cooks said they hope to make it more elaborate each time. Also planned for the future, Deb wants to turn the show into a fundraiser and collect donations for Toys for Tots or the local food shelf. It really does bring in the spirit, she said, adding that right now their goal is to just make people happy. Anyone interested in checking out the display should do so early in the evening because the lights automatically switch off at 10 p.m. on weeknights and 11 p.m. on weekends. “The neighbors would like to sleep sometimes,” Deb Cook joked.